Kalumbila minerals limited has suspended an employee for posting a comment on Zambian Watchdog. Jefferson Mateyo, a tracked Dozer operator at Kalumbila mine has been charged with offences such as false accusations, spreading rumours and giving false information. According to a suspension letter signed by Mining manager Junior Keyser, Mateyo posted a comment on Zambian Watchdog on Independence Day 24 October 2018. On that day, the Watchdog published an article entitled ‘Kalumbila general manager bribes government employees’. 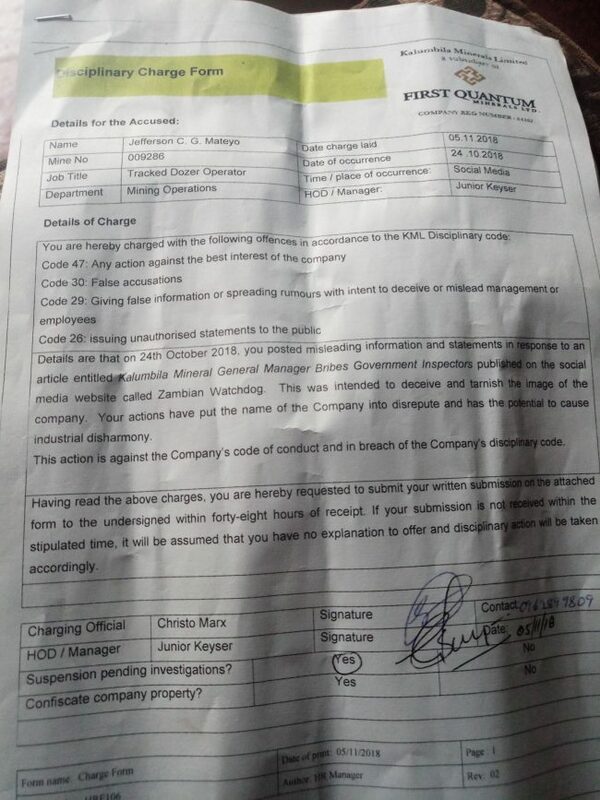 The Watchdog understands that Mateyo is not the only one in trouble for posting comments at the First Quantum owned mine based in North Western province.